Ukuran pratayang ini: 770 × 600 piksel. Resolusi lain: 308 × 240 piksel | 616 × 480 piksel | 986 × 768 piksel | 1.280 × 997 piksel | 3.738 × 2.912 piksel. Gambar ini merupakan gambar bernilai dan dianggap memenuhi kriteria gambar bernilai. Dengan nisbah bidang 4:3 atau 5:4, gambar ini sesuai digunakan sebagai wallpaper komputer (lihat galeri). Berkas ini merupakan gambar pilihan di Wikipedia bahasa Parsi (نگاره‌های برگزیده) dan ia dianggap salah satu gambar terbaik. Bosanski: Louis Armstrong, američki jazz muzičar. Čeština: Louis Armstrong, jazzový trumpetista. 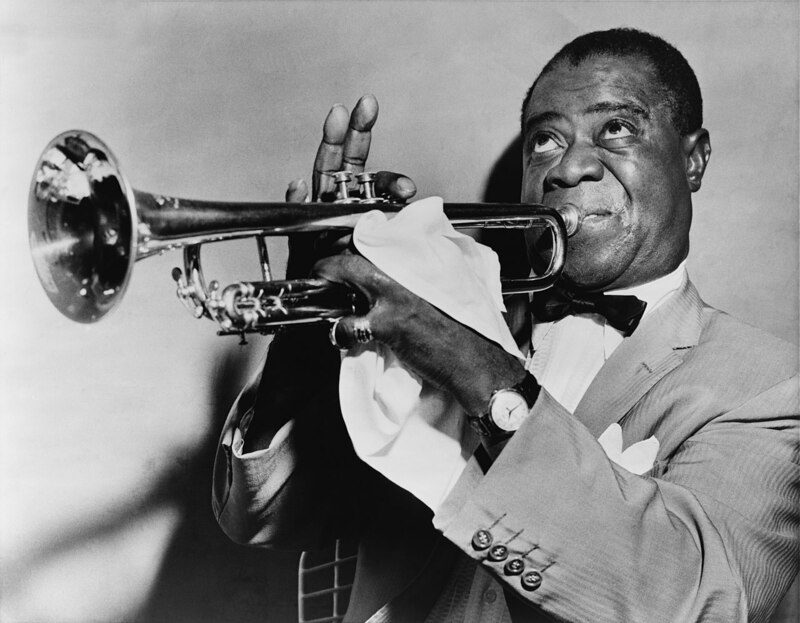 Español: Louis Armstrong, trompetista de jazz. Italiano: Louis Armstrong negli anni cinquanta. Nederlands: Een foto uit 1953 van Amerikaans jazztrompetist- en zanger Louis Armstrong. Polski: Louis Armstrong, trębacz jazzowy. Português: Foto de 1953 do trompetista e cantor de jazz americano Louis Armstrong. Русский: Луи Армстронг — американский джазовый трубач. 한국어: 재즈 트럼펫 연주자 루이 암스트롱. Berkas ini tidak memiliki deskripsi, dan mungkin kekurangan informasi lain. Harap memberikan deskripsi yang berarti dari berkas ini. Sumber Library of Congress Prints and Photographs Division, New York World-Telegram and the Sun Newspaper Photograph Collection. under the digital ID cph.3c27236. This work is from the New York World-Telegram and Sun collection at the Library of Congress. According to the library, there are no known copyright restrictions on the use of this work. This photograph is a work for hire created prior to 1968 by a staff photographer at New York World-Telegram & Sun. It is part of a collection donated to the Library of Congress and per the instrument of gift it is in the public domain. Photographs in this collection other than those identified by such stamps as "World-Telegram photo" or "World-Telegram photo by Ed Palumbo" might not be in the public domain. Works within the collection may be attributed to other news services that retain copyright, works of the U.S. government that are in the public domain in the US, or works with no attribution for which copyright cannot be determined.